For my next First Annual Blogger Bioblitz site, I decided to visit another under-observed ecosystem. Tibbett’s Brook Park, a pleasant public space built around a chain of ponds, lies just north of the Bronx. I’ve done very well here in the past as far as birding goes. However, my success is usually predicated on closely scrutinizing a large area of mixed habitat. This time around, my amazing three-year old, Mason rode sidecar, which is to say I did a lot of watching him and not so much bioblitzing! “Prosaic” would be the best description of the birding during this lovely late April morn. Grackles, blackbirds, robins, pigeons, and the usual waterfowl represented most, if not all of my avian sightings. My response was to pay more attention to the other animal like. Eastern Gray Squirrels were as common as ever, but joined in this location by lots of chipmunks. Plentiful Painted Turtles soaked up sun from every sunken branch. Like I said… prosaic. The morning’s excitement came from an unexpected corner. Striking out with fauna, I gave flora a second look. Two stunning little species of wildflower had me scrambling for some sort of online identification guide (thanks, Bev!) 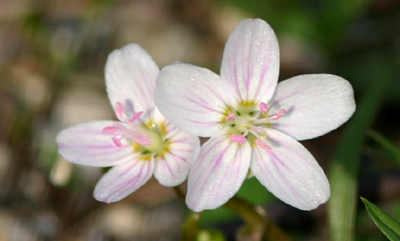 The first flower, displaying five soft white petals with delicate pink veins, was Common Wood-sorrel (Oxalis acetosella), a native of moist woods. The Latin name for this type of wood-sorrel refers to its sour taste, though I cannot attest to its veracity. Though I wasn’t exactly on a first name basis with the wood-sorrel, I had seen it around so to speak. I wasn’t at all familiar, however, with small clusters of yellow blossoms, sharp heads drooping under the weight of stamens laden with pollen. 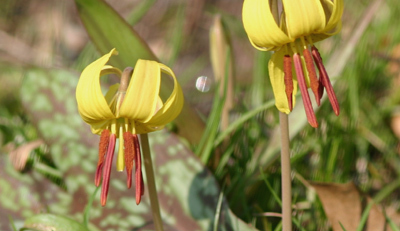 These, I learned, were Trout Lilies (Erythronium americanum), so named because someone thought its green and brown splotchy leaves, noticeable in the rearground of the photo below, resembled the speckled skin of its namesake fish. Although I’d never noticed these lilies, also known as Dogtooth Violet, before, I’m not likely to miss them again. I think you might have Spring Beauty there as opposed to Wood-sorrel. Do you remember what the leaves were like? Spring Beauty is pretty common this time of year. Wood-sorrel has clover-shaped leaves and SB has grass-shaped leaves. Also, the anthers on SB are pink and they’re white on WS. Patrick, you may be right. These flowers did have grass-shaped leaves. It’s amazing how similar the blossoms are considering that the flowers are not even in the same family. Thanks for the tip!